What happened to you? I know I haven't seen you in a year, but you've changed. You're not like I remember you at all. I hardly even recognized you at first. The only thing that tipped me off that it was you was the few trees you've been turning yellow. But your heart isn't even in that, Autumn. The leaves almost look brown, and half of them haven't even turned at all. What happened to your bright colors? What happened to that lovely briskness you brought to the air? I don't understand why you've been giving me 90 degrees when I want your usual coolness! I miss sweaters, Autumn. I miss hot soup and tea. I miss how my nose used to get cold after a little time in your presence. I know what's going on. You've been hanging out with Summer too long. I know she's bubbly, and cheerful, and warm. She's appealing in her own way. But Autumn, we love you for who you are. We don't want you to turn into Summer. You have so much to offer, so many gifts to give the world, but we can't be blessed by them unless you just be yourself, instead of trying to be like Summer. Don't you miss our old jaunts through the spicy, brisk air? Don't you miss the sweaters and soup and tea that you used to inspire us to? Don't you miss everyone exclaiming about the glorious colors you painted the trees? Come back to us, Autumn. Even if you don't miss us, we miss you. Last night we had a meeting with our Young Married Group. Remember when I talked about starting that group with my friend almost a year ago? Well, we're still meeting, and really enjoying it! There are only three couples total, but we have a really good dynamic, and it's fun doing our monthly get-togethers. It was our turn to have the Bible study at our house. Typically if it's your turn, you also make a dessert for everyone to enjoy while we do our discussion. So, I decided to make an apple crisp. What says "fall" like an apple crisp, I ask you? I was going to get the Apple Brown Betty recipe that my mom had, but I forgot to get it from her before yesterday, and she couldn't get it for me before I needed to make it, because she was still at work. She did, however, send me a link to an apple crisp recipe, and I ended up using that one. It turned out very well! I had to bake it longer than the 40-50 minutes suggested on the recipe, but the apples turned out soft, the topping wasn't too soggy, and it was fabulous with scoop of vanilla ice cream! It was also pretty easy to make, and used basic ingredients (my favorite kind of recipe). So, out of the goodness of my heart (aren't I so nice? ), I've decided to share it with you ladies! I've italicized the areas where I've modified it a bit. Okay, a lot. I hardly ever follow a recipe exactly. I estimate, I change ingredients, I add more than I should. Yes, I butcher them. But they usually turn out well anyway. I'm just not a follow-the-directions-exactly kind of girl. Actually, yes I am. Almost always. But not with food. Combine 1/2 sugar, lemon juice, a little lemon zest, water, vanilla, and cinnamon. 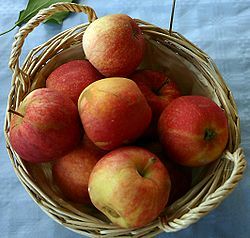 Marinate apples in combination and pour into a small baking pan (square). Combine 1/2 sugar, flour, salt, butter (make sure butter is softened), and a little cinnamon. Crumble and sprinkle 2nd combination over apples evenly. Bake at 375°F for 40-50 minutes (I had to bake it for an hour, but it may have been because I used the rice flour instead of regular flour) until apples are tender and crust is browned. Serve, best with warmed vanilla ice cream. I believe my mom got this recipe (if you can call it the same recipe after I altered it so much) from Cooks.com, and it was a hit! What are your favorite fall recipes? Share, please! Every pregnant woman needs a cute pair of maternity jeans! Last week I bought my first pair of maternity jeans from Kohls. I was originally trying to find some cheap maternity pants at different thrift stores. Sometimes you can find really cute things at thrift stores for very reasonable prices. I checked about seven or eight different Goodwills, Salvation Army, and ARC thrift stores, and I've finally concluded that people give all their old and really ugly maternity pants to thrift stores. I'm sorry, even though they're only five bucks a pair, I'm just not wearing that. I want to be a cute pregnant woman, thank you. So, I went ahead and bought a pair from Kohls. They are lovely. My regular jeans were just getting too uncomfortable, even with the rubber band trick and my BeBand from Target. I've also noticed that my belly seems to relax a bit more, since it's not being squished into jeans that are too tight, and I look more pregnant. The great thing is, they look like any normal pair of jeans, and they're actually very cute while still being very comfortable. A word to the wise though: do not order maternity pants online without trying them on first. You're supposed to just buy maternity clothes in your pre-pregnancy sizes, but unfortunately, the way the same size fits varies widely between brands. One size 4 may fit you perfectly, another size 4 may give you the saggy-behind look. Not pretty. I would recommend trying them on somewhere before ordering, or at least making sure that you can return them easily if they don't fit. I'm expecting to buy one or two more pairs of maternity pants in the next couple weeks. I discovered a very flattering pair of maternity jeans at JC Penny that I may possibly buy, and my sweet sister-in-law gave me a gift card to Motherhood Maternity, which I may just use on a pair of pants as well. Once you've given in to the maternity pants, it's hard to go back. I think someone may have recognized me as being pregnant this past week. It's a little unclear. I was on my way home, and I was trying to think of something good to make for dinner. For some reason I feel like I'm in a cooking rut lately. I never know what to make anymore, except spaghetti, and that's getting a little old. I decided since I've finally gotten over my aversion to chicken from the first trimester, it would be a good time to make an old favorite for Derek and me - honey mustard chicken with steamed vegetables. We always like to eat it while watching the Biggest Loser especially, and since the new season started this week, I decided it would be a good time to break it out again. Unfortunately I was out of mustard. Mustard is just not one of those things that you remember to buy at the grocery store. I stopped at the gas station to pick some up, and waited in line while an older gentleman in front of me bought lottery tickets. The lady at the register finally called me up, and I plopped my bottle of mustard down on the counter. It was slightly awkward, because Mr. Lottery Gambler decided to scratch his lottery tickets right there at the counter. So I squeezed into the available space between the register and the old man, and started digging around in my purse for a dollar bill. Then the lady at the register started to talk. I wasn't quite sure if she was talking to me or Mr. Gambler, but she said "Man, when I was pregnant, I loved mustard. I wanted to put mustard on everything. And now I hate it." Unfortunately I'm not very quick on my feet, and I couldn't think of the appropriate thing to say, so I just said the standard "Oh really?" comment. I was still trying to figure out if she was making the pregnant comment because she realized I was pregnant, or if she was just making conversation. I should have just blurted out "Do you really think I look pregnant?" But see that wouldn't be the right thing to say either - I would either look over-eager, or she would think I was offended because I wasn't really pregnant. I'm sorely tempted to go back and ask her if she could really tell, but that would score even higher on the creepy, over-eager scale. I'm afraid it must remain a mystery. But I prefer to think she could tell that my belly pooch was from a baby, and not an excess of mustard-covered chili dogs. 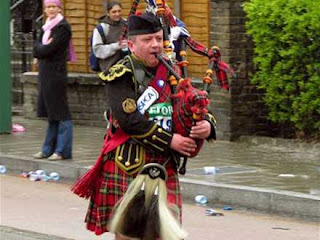 If there is one instrument that is inspiring to me, it is the bagpipes. That first tone just always gives me the shivers. I love listening to them being played, because the music seams to seep into my very being and wake up my soul, especially when it's a song that is also meaningful to me. There's something so deep and woodsy and rich about the sound of bagpipes. It's something about that humming undertone to the pipes, but it makes every note so much more penetrating. Violins, saxophones, a deep notes played on flutes all do the same thing for me. I just love it. Maybe those rich, woodsy sounds hold more meaning to me because of some childhood memory. Maybe they just fit better into the music score of my life than other lighter instruments do. Or maybe it has something to do with my love of Autumn. All of the above instruments would fit into my idea of "Autumn instruments" and they all play what would be my idea of "Autumn music". I don't know what it is that makes me love them so much, but I don't anticipate getting over it very soon. I haven't in the 20+ years I've lived so far. So this stormy afternoon, I'll sit here and listen to my Songs of the Piper CD, as the melodies of "Fairest Lord Jesus" and "All Creatures Of Our God And King" and other well-loved hymns fill my living room. I'll enjoy the beautiful Fall colors outside my window, feel the moisture in the air from the rain, inhale the scent of dinner cooking, and just let the notes wash over me and into me again. Listening to Song Of The Piper: 36 Hymns and Traditional Tunes. Another Ultrasound And Four Months! I am now four months pregnant. It's hard to believe that in just a little over five months, I'll be holding Babykins in my arms! Last week, I was able to have another ultrasound! To make a long story short, I was having some concerns about some fluid leakage; it doesn't look to be amniotic fluid, but it beats me as to what it was. No more fluid problems since last week, and the doctor I like gave me some pH paper to test anything suspicious at home, but you know I always want your prayers! There doesn't appear to be anything to worry about, so I'm just going to take it easy and watch it for now. We're just trusting in the Lord about the whole thing - I know He'll always be there for us, no matter what might happen. Anyway, they ended up doing an ultrasound to make sure there was enough amniotic fluid around the baby, and I was perfectly fine with that. It just makes you feel better sometimes to be able to see your baby. Everything looked great, and Babykins is measuring a couple days big again! It makes me so happy to know for sure that the baby is growing well. The ultrasound tech didn't seem to appreciate my questions (I tend to ask alot of questions), otherwise I would tell you for sure how big our little one is. The ultrasound tech also wasn't the best at taking good pictures. Babykins was in a sleep cycle again during the ultrasound, but I think he/she could sense the pressure on my belly, because the baby started waving his/her little arms around, and brushing his/her face. It was so adorable! I really wish she had taken a picture of that, because it was just precious. We did get a profile shot and a picture of Babykin's tiny hand! The profile isn't the best, because you can't see the sweet little nose (which I could see before, when Baby was rubbing his/her face), but still cute, I think. As for me, my pants are getting tight. There are a couple pairs that I can still kind of button, but it's rather uncomfortable. I've been very tired and I'm having some headaches this week, but nothing too terrible. And lots of heartburn. That baby is going to have hair! To the general public, I still don't really look preggo, I just look like I have a muffin top. But I can sure tell! Here's the most recent belly shots. Do you know, my baby is six or seven inches long now? My goodness! How am I not showing more than that? Six or seven inches is so big! In summary, I'm feeling great, the baby and I are both getting bigger, and as always, your prayers for a healthy pregnancy mean so much to me! Now I just have to decide how long to suffer with my normal pants . . . Does anyone else have as much trouble with patience as I do? I just realized this past week how impatient I can really get. I started thinking about it more after a Community Bible Study lecture last Wednesday - it was mainly on how we are sometimes called to wait for certain things in life. But with today's culture, it's so hard to wait, is it not? We don't have to wait long for almost anything these days, and it makes it harder to cultivate the habit of patience. After that lecture, I was a little more conscious of my impatient attitude. There are the long lines at the grocery stores. The slow people in the buffet line that sorely tempt you to line-jump. The frustration when the internet is a little slower than you think it should be. That irritation at the driver that's going 45 mph in a 50 mph zone (the nerve)! Is it really that big of deal if I have to wait an extra 48 seconds for a web page to load? Or if I'm 5 minutes later getting to my destination by going less than the speed limit? Would it kill me to just be patient with the slow buffet-line people or check-out clerks? I feel like I'm living in that old Alabama song, "I'm In A Hurry (And I Don't Know Why)". "Give, and it will be given to you. Good measure, pressed down, shaken together, running over, will be put into your lap. For with the measure you use it will be measured back to you. He also told them a parable: 'Can a blind man lead a blind man? Will they not both fall into a pit? A disciple is not above his teacher, but everyone when he is fully trained will be like his teacher. Why do you see the speck that is in your brother’s eye, but do not notice the log that is in your own eye? How can you say to your brother, 'Brother, let me take out the speck that is in your eye,' when you yourself do not see the log that is in your own eye? You hypocrite, first take the log out of your own eye, and then you will see clearly to take out the speck that is in your brother’s eye.'" You know why this passage was so convicting this time I read it? It is because I realized that even though I have very little patience with other people, I expect them to be patient with me. I get annoyed when that impatient driver shoots past me in the passing lane. I expect people to just deal with it while I count out my change to the cashier. And I think they're pretty rude if I see an eye-roll or hear an impatient remark (not that I'm ever that obvious - I just stew in my impatience on the inside). Funny how we expect people to wait for us, but we don't graciously give them the same courtesy. I don't know about you, but on this issue, I have a big old log in my eye. "For with the measure you use, it will be measured back to you." More scary words. I can't really expect others to be patient with me if I'm not patient with others myself, can I? I don't want that same measure I use on other people to be measured back to me. But it will be - that's what Jesus assured us of when He said that. The only thing that can change would be my own measure. I also know how important patience will be when I have this sweet baby. I'm not sure you can be a really good parent unless you have patience with your children, and it is important to me to be a good example to my children as well. I don't want them to grow up with an inability to wait because of my own failure in this area. My new goal is to work on cultivating patience. Not only will this make me and my family generally happier and help me avoid the unpleasant experience of having my own impatient measure used on myself, but it is obeying God's command to be patient with others. And pleasing God is what ultimately matters in life. And you know, patience is a virtue, after all! 1. My new body pillow! Everyone keeps telling me how you need to get a body pillow when you're pregnant. So when I saw this lovely body pillow at Walmart for twelve dollars, I decided to give it a try. I'm starting to get to the point where it's uncomfortable to sleep. I can't seem to find a good position. I'm usually a stomach sleeper, but whenever I try to lay on my stomach anymore, it hurts. My body is protesting, and I'm pretty sure I'm squishing Babykins when I do that, so I've resigned myself to the uncomfortable side-sleeping position. Oh, that pillow makes life so much more bearable! I can lay my head on it, prop it between my knees, and hug it, and it's pretty much a life saver right now. I can actually get comfortable when I sleep! This is a good thing. And it's a pretty purple too. Derek is being such a good sport about it being in the bed, though he'll occasionally through in one of the traditional "it's replacing me" jokes (but it's not, and as soon as I can sleep on my stomach again, it'll be out). I have such a sweet husband. 2. These adorable baby shoes that I also bought at Walmart for five bucks! Aren't they the cutest things ever? I couldn't resist - I had to have them. Of course I don't know if it's a boy or not, but if it is, he'll have well-dressed feet. I'm planning on buying some cute girl shoes when I find some too, just in case it's a girl. They didn't have any extra-special girl shoes this time, so I'm still keeping my eyes peeled. Boy, I want to find out the gender! Another month and a half to go . . .
3. 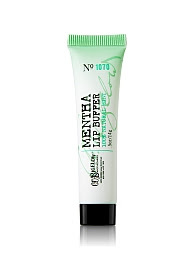 This Mentha Lip Buffer from C.O. Bigelow! My lips have been so dry lately. They look really ugly, because you can see how chapped they are. It must just be the fact that it's fall - and i think I heard that your skin and lips can get more dried out when you're pregnant? I don't know if that's true, but either way, my hands and lips have been very dry. This stuff contains a gentle abrasive (sugar, actually), and you just put some on and rub your lips together, and the sugar crystals remove all the dead skin. Then you just wipe or lick it off, and your lips are smooth as butter. Then you put on your lip balm, because now it can actually do some good, or your lip gloss, because now it will actually look pretty. It's very nice stuff. That wraps up the list for today - I'm off to paint the bedroom. Yes, it's finally getting done. Wish me luck. I've got some baby updates for next week, so stay tuned! Finally, the long awaited paint color post! I finally decided on a paint color for our downstairs bedroom. And the final decision is . . . Neither of the afore-mentioned colors! Here's a picture of the four samples of green paint that I got. I'm afraid that the colors aren't really represented very well in this picture - I tried to adjust it a bit so they look a little more true to real life, but still not perfect. They all look just slightly duller here than they do in person, so keep that in mind when viewing my choices. Turned out that the pepper green (far left in picture) is really nuclear on the wall in person. Scotland Isle (second from the left) was just too dark and brown for my idea of what I want the bedroom to look like, I'm afraid. Thank goodness for paint samples, because I would never have known this about either of those colors if I hadn't got some samples and actually painted them on the wall! Thankfully, I also threw in a couple other possible greens when I picked up the paint colors. Those would be the two on the right in the picture. The far right one, Asparagus, is just a tad too yellow for my purposes. Which leaves us with the winner, Herbal Garden (second from the right)! Like I said before, it doesn't look quite right in the picture I took, but trust me, in person it's a nice cheery green color, but without being too obnoxious. 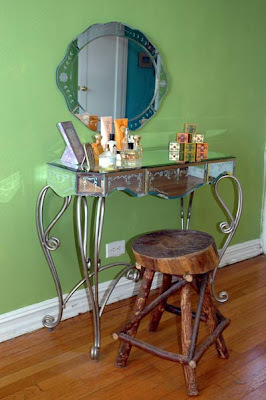 Here's a couple examples of a room painted in Herbal Garden from Apartment Therapy. 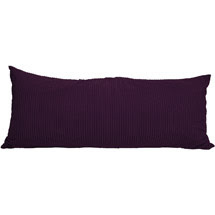 This isn't how I'm going to decorate our bedroom, but it gives you an idea of the color. 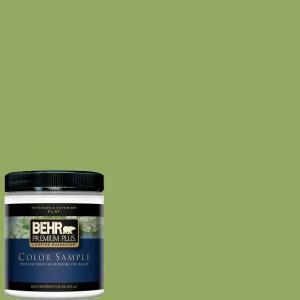 And the Behr paint chip form the Home Depot website. I'm actually getting really nervous about the color now that I've made my choice. You see, I grew up with all white walls. This is my first serious departure into the world of color. I really have no clue what I'm doing. I'm pretty terrified that it's going to look ridiculous once I get it on the wall. But then I remember that it would fairly inexpensive to pick a different color and re-paint the room if I get it on the wall and just hate it. I can always change my mind later. 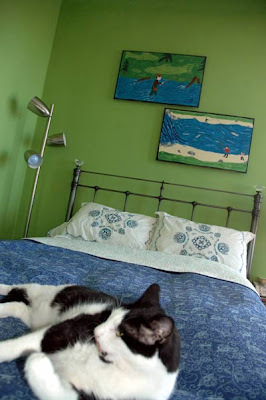 The green color for a bedroom does seem rather obnoxious though, doesn't it? 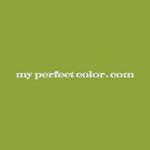 To the average observer, they would see that color on the wall, without my furniture or anything in there, and think "What is Callie thinking, painting a room that hideous color?" Let me assure you, I have a vision. In my head, the finished product with all my furniture and linens and decorations looks lovely. I just hope I can pull it off. And if I hate the color I can always try a different shade. And it won't be a big deal. I was talking with my sister yesterday, and she informed that she had read an article that quoted a study which said that women who have bedrooms that are painted in bright colors are generally happier. It's a true statistic. I'm all for feeling happier and more energized. And I am trying to break out of the white-wall box. I need a pep-talk from you people with actual colors on your walls! First of all, in case you missed it, congratulations to Brittney Galloway at Far More Than Rubies - she just announced that she and her hubby are going to have a baby! I'm so happy for you Brittney, I know you're going to make a wonderful mom! Thought I'd better throw the above paragraph in there, because if you're anything like me and get way behind in your Google reader, you may have missed it! And it's super exciting news - very happy for you, Friend! On to the regularly scheduled programming . . . I have fond memories of the songs of my childhood. My sweet mom must have gotten so tired of listening to kid's music tapes all the time. We didn't listen to the radio much in the car growing up - we mostly listened to our children's Bible tapes, some of my mom's Christian music tapes, and Christian radio. My mom was careful to make sure that we were listening to and watching good, pure things when we were young, and I so appreciate her desire to protect our minds now that I'm going to have a sweet baby of my own. I plan to do the same with my kiddies. I'm sorry, but it just doesn't seem appropriate to be listening to songs about break-ups, hook-ups, drinking, or other bad stuff that sometimes get played on the radio when there are innocent, impressionable young minds listening. Nope, I'm going to constantly suffer through children's music too. At least these days we have more resources to help us as parents. I plan on burning a couple "child friendly" country music CDs or playlists, filled with nice, innocent songs, and Derek and I could listen to that with the kids in the car sometimes. Plus there are way more Christian music radio stations now, which will be quite helpful too. But I mainly want my children to listen to songs about Jesus. I want to teach them about Him and His love for us from a young age. I'm so not up on all the new Christian child resources out there now. But here are some of my favorites from when I was a kid. The Donut Man. I was very pleased to find out that Donut Man music is still around! It seems like all the really good ones disappear over time. These tapes (well, they're CDs now) are filled with fun Bible-related songs and even memory verses. I think one of my favorites was The Centurion's Secret song, which told the story of the Centurion soldier who asked Jesus to heal his servant. I also loved the whole Good Shephard album - lots of good songs on that one. There are apparently a bunch of new ones too, and ones that we didn't happen to own when I was little, so the Donut Man website will be a good resource I think. Another fun one is Psalty the Songbook. Just so happens that this one still exists too! I looked on the website and can not for the life of me figure out which album we had when I was a girl - we only had one Psalty tape. But just trust me, these are also good ones (especially the "Kid's Praise" albums - I have a feeling it was one of those). One year for Christmas we each got a new Bible Song CD. We'd all listen to each other's CDs (weren't we so good at sharing? ), and one of my favorites was my sister's CD. She got one of Steve Green's Hide 'Em In Your Heart albums. Basically it's just Bible verses put to music. Even to this day I still remember some verses because of those songs. I think this is an especially good thing for Christian kids to listen to, because it's just God's Word - and His words do not return empty but always accomplish the purpose for which He sent them (Isaiah 55 10-11). Oh my goodness, Google is a wonderful invention! I wasn't sure I was going to find any of these CDs anymore, because they were made a long time ago - but with the help of Google I've found every one! This one is just fun. 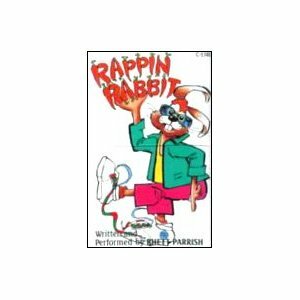 The Rappin' Rabbit tape was one of our favorites as kids, just because it was so different from our other tapes and fun to listen to - but it still included good, godly principles in each of the songs. Unfortunately it appears that they are no longer making this one, but you never know, someone might decide to re-release it someday. And that, my friends, is my "Bible Music For Kids" resource list. What kind of songs did you listen to when you were a child? Do you think they influenced you even as you grew up? It's so refreshing to know that most of these are still available to buy. Makes me want to search for other items from my childhood before they all disappear. Maybe I'll have to do another one of these posts on children's books . . .
A Chocolate A Day . . . It's rich. It's decadent. It makes us happy. Doesn't the thought of chocolate instantly make you feel better? It's my favorite stress food - I had a major financial stress breakdown moment this weekend, and a little chocolate did the trick. But stress relief isn't the only good thing about chocolate. I was reminded again of the many benefits of chocolate this past weekend. Let's list them, shall we? 1. Chocolate causes the release of endorphins in your brain. Endorphins make you happy, decrease feelings of pain, and enhance your immune response, among other things (Resource 1). 2. Dark Chocolate can help lower your blood pressure, and it also contains lots of antioxidants (Resource 2). Antioxidants help fight "free radical" molecules and help maintain healthy cells and tissues. Recent research from the University of Scranton shows that chocolate contains more antioxidants than "tea, red wine, apples, oranges, and various vegetables" (Resource 3). The most antioxidants are found in cocoa powder, then dark chocolate, then milk chocolate. 3. Chocolate contains potassium, magnesium, B vitamins, and vitamins D and E (Resource 4). Since all these nutrients are found in chocolate, chocolate bars (particularly with dark chocolate) are not really just empty calories as some may think. 4. I think we all know how chocolate lowers stress. All you need to do is eat a bit of chocolate during a stressful day, and you immediately feel better, no? A recent study showed that eating some chocolate everyday did lower stress hormones in the participants - the same study also showed possible benefits for metabolism and microbial activity in the digestive system (Resource 5). 5. It's quickly coming apparent in recent years that chocolate in moderation (yes, you can't eat all the chocolate in the world and avoid gaining weight, unfortunately), mostly dark chocolate, can have many positive effects on a person's health. One study showed that a 1.6 ounce bar of dark chocolate is good for your body's blood flow and heart (Resource 6). 6. And finally, the possible benefit that I most recently read about. I read in American Baby magazine that if you have a little bit of chocolate every day, your baby will be happier at 6 months old than if you don't. I believe they got the information from a book entitled "Origins: How The Nine Months Before Birth Shape The Rest Of Our Lives", by Annie Murphy (Resource 7). Who doesn't want a happy baby, I ask you? I'm willing to give it a try! I want to note right now that the health benefits of chocolate that I listed above are mainly associated with dark chocolate. The higher in cocoa concentration, the better. Milk chocolate doesn't have the same effects. In fact one study suggested that even milk eaten together with dark chocolate "may interfere with the absorption of antioxidants from chocolate" (Resource 2). So eat your chocolate dark if you want to be healthy. That works for me, because personally, I like dark chocolate best! I also want to note that if you eat too much chocolate without compensating for the calories in other areas, many of the possible health benefits are for naught. Gaining weight from too much chocolate isn't healthy. You have to compensate for the extra chocolate calories and everything will be golden, okay? That said, anybody have any reservations left about having a little square of rich, decadent dark chocolate per day? Many happy, chocolate moments to you! 1. Stoppler, Melissa Conrad, MD. Endorphins Natural Pain and Stress Fighters, 2007. Link: http://www.medicinenet.com/script/main/art.asp?articlekey=55001. 2. Denoon, Daniel J. Dark Chocolate is Healthy Chocolate, 2003. Link: http://www.webmd.com/diet/news/20030827/dark-chocolate-is-healthy-chocolate. Vinson JA, Proch J, Zubik L. Phenol antioxidant quantity and quality in foods: cocoa, dark chocolate, and milk chocolate. J Ag Food Chem 1999; 47: 4821-4824. 4. Parkinson, Rhonda. Health Benefits of Chocolate. Link: http://chinesefood.about.com/od/westernhol/a/chocolate.htm. 5. Warner, Jennifer. Dark Chocolate Takes Bite Out of Stress, 2009. Link: http://www.webmd.com/balance/stress-management/news/20091113/dark-chocolate-takes-bite-out-of-stress. 6. Denoon, Daniel J. A Dark Chocolate A Day Keeps The Doctor Away. 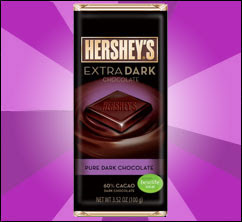 Link: http://www.webmd.com/diet/news/20040601/dark-chocolate-day-keeps-doctor-away. 7. Murphy Paul, Anne. Origins: How The Nine Months Before Birth Shape The Rest Of Our Lives. Not Yet Released. Link: http://www.amazon.com/Origins-Months-Before-Birth-Shape/dp/0743296621. So that we never forget what happened that day. I found a stray dog last night. As soon as I got home from work I saw this little black dog playing with Quincy and Harvey. His name is Boo. The owner's number has been disconnected. I called the veterinary clinic that gave him his rabies shot, hoping they could find the owner, but no call back as of Thursday night, which is when I'm writing this. Boo just may be having a doggy sleepover with us until I can call again in the morning. In other news, I'm dying for some Zachary Gourmet Candy Corn. Remember, the kind I included in that giveaway last year? Boy, it was some good stuff. I went on a candy corn hunt at Walmart, but they don't have it one the shelf yet. Boo! Boo as in I don't like that, not Boo as in the dog. I heard on the radio yesterday that Donald Trump is trying to buy out one of the real estate investors that owns that piece of land at Ground Zero that they want to build a mosque on. If he gets it, he'll require that the mosque be built five blocks away instead. I hope he gets it - I think that would be a nice peaceable solution to the whole problem. 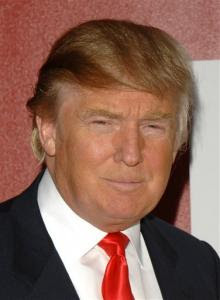 Go you, Donald Trump! I'm definitely watching The Apprentice this year. Always kind of liked the Donald. Here's an article about Trump's effort at settling the Ground Zero Mosque debate. Oh rats, I just read some more news, and the guy declined Trump's offer. Boo! As in, I don't like that. Oh well. It was a good effort. Derek has had to work late all this week (budget season), so I'm left home all alone these evenings. How depressing. I think I'm going to watch a girl movie and eat some fudge tonight. I just bought an ESV Bible, and I'm super excited about it! Why? Because according to John Macarthur (who I happen to trust as a Bible teacher), the New American Standard Version and the English Standard Version are the most accurate translations of the Bible (meaning, the most accurate to what the original Hebrew and Greek were saying). He also gave the New King James Version an honorable mention as an accurate translation too, which is the version I currently use. But I'm excited to be able to compare in the ESV now. Which Bible translation do you use? I'll close this totally random post now. Please proceed to leave me any totally random comments that you may desire to compose. It's been a long time since I did a basement renovation update. I've seriously been slacking. Shame on me. So last weekend I asked Derek to film a video for me showing you all the basement. He's such a good sport, dealing with all my odd requests related to blogging. Come to think of it, I should have taken the camera from him for a minute so he could have been in the video too. Oh well. Please excuse my messy hair - I obviously didn't comb through it very well before taking this video. And videos always turn out best on the first try - if I had brushed my hair and tried again, it would have taken five more takes to actually get it right. I think it's because I have too much time to think about what I want to say, and then it doesn't come out right, or I stumble over my word or something. The bottom line is you're left with a video of me with messy hair. I'm pretty sure you guys won't care (you aren't going to make fun of me behind your computer screens, are you?). I did decide on a paint color, but like I said earlier this week, due to circumstances beyond my control, I was forced by Derek and my mother to spend Monday resting instead of painting like I wanted to. But they were right, it was good for me to take a rest. I actually need to ask you all about a paint color for a different room now. Oh, choices, choices. And I know some of you were concerned about it, so let me reassure you that Babykins is just fine. I've been feeling fine ever since, and I got to hear the bebe's heartbeat again on Tuesday. He/she was swimming around again, and I think there must have been some kicking going on, because there was a couple of loud "thwomps" that we heard on the machine too, right before Babykins swam away - maybe some of the water being swished around? Boy, I wish I could feel it! Soon enough, I suppose. Last night I wrote a venting post. I don't remember writing too many of those in the past, but something really got me riled up. Basically, I had to go to the doctor yesterday, and I saw a doctor I hadn't seen before, and I was really unhappy with the way she treated me. I was so upset I wrote a big drawn-out post about it. I had it all scheduled to post this morning and everything when I got to thinking: is it really God-honoring to spend that much time in a blog post complaining? Because that's what venting posts really are - complaining posts. I know sometimes you just need to vent and cry out your frustrations to someone, but that's something best saved for a conversation with the hubby, or with my mom, or better yet, with the Lord, rather than something to be immortalized in the blogosphere. I want my blog to be a place to honor the Lord, and showcasing my frustrations and selfish attitude (you know, "the how-dare-she-treat-me-that-way" one) is not a way to honor the Lord. I realized this week how much in my everyday life that I focus on me, and my rights, and my feelings, and my wants. That's not God-honoring either. It's putting my own self at the center of my life, and that's just not right. Does this sound familiar? I'm pretty sure I've blogged about it before. That's because it's something I really struggle with. Anyway, here's my non-complaining post. The Lord has blessed us with so much, and done so much for me personally, that it's silly of me to focus so much on my own irritations or wants, and whine about them, when I should just be thanking Him for everything He's done for me and remembering daily His wonderful works in my life. 1. I'm thankful to the Lord for giving me such a sweet, understanding husband, who overlooks so many of my faults and loves me unconditionally. 2. I'm thankful that I even have a baby to be worried about! I don't forget how hard it was to get this sweet baby in the first place. 3. I'm thankful that I don't really have to worry at all, because the Lord has everything under control, and will always work things out for my good (Romans 8:28). 4. I'm thankful for a roof over my head and enough money to pay the bills. 5. I'm thankful for my funny dogs, who always cheer up my day, and I'm thankful the Lord thought of making dogs for us to enjoy. 6. I'm thankful that we have doctors who can give us guidance when issues come up, and I'm even more thankful that our Lord is the Great Physician and can heal all our diseases. 7. I'm thankful for my Saviour, Jesus Christ, Who died to wash my sins away, and Who I look forward to spending Eternity with. There. Those are just a few things, but it helps so much to just re-focus. Maybe I should make this a more regular feature on the blog. I really have no room to complain about a little rudeness at the doctor's office when the Lord has blessed me so much. Did you all have a good weekend? Mine was good, though due to unforeseen circumstances, I did not get the basement painted after all. I did, however, decide on a paint color, and I will reveal the decision soon! Basement update is also coming soon. I figured it was about time for another pregnancy update! Here's my 14 Week belly pictures. Babykins is almost five whole inches now! I think that's pretty amazing. He/she also weighs an ounce or a little more - we're into ounces now instead of grams! I got to hear the heartbeat last week. The nurse said the baby must have been swimming around in there, because she kept having to move the machine around to find the heartbeat! Of course, I couldn't feel the movement yet, but she said I may feel it earlier than normal because I'm "on the skinny side". My first thought was "Thank You!" because I do not feel skinny, and then I was happy to know I may start to feel movement within the next few weeks! I'll pay good attention and keep you updated. I may get to hear the heartbeat again today, because I'm headed back to the doctor about some symptoms I've been having - nothing to worry too much about, I'll let you all know if it's something more serious (but you know I always appreciate your prayers). In other news, I got another baby gift! You'll remember how my sweet sister left that gift on my kitchen table? Well, I had to wait the whole weekend before we could open it, but we finally did. Here's what she got us! Two little baby outfits, one for a boy and one for a girl! Isn't that just so sweet of her? Are they not just adorable? I love the green. She bought them in sizes that will fit the baby all through next summer. Thanks, Rach! You're the best sister ever! This week is shaping up to be a weird week, so I may not get to blog as much as normal, but I'll be back in the swing of things by next week. Just in case you start wondering. My Happiness Depends Upon It . . . This is the question, Folks. It will affect my life for years to come. I'm trying to decide which color of green to paint our new bedroom downstairs. Yes, the basement is coming along nicely! Details are on their way - look for a post next week. By the way, congratulations to my blogging friend Jenene, who just announced that she's pregnant! Jenene's blog was one of the first that I found when I started being more "serious" about blogging two years ago, and I'm so glad I did. She's a wonderful Christian girl, and I'm so happy for her and her husband, Art! Her sweet baby is due in April. Very happy for you, Friend! And thank you to Chloe for the award - more on that to come. I hope you all have a wonderful Labor Day Weekend! I'll be spending mine trying to decide the above, all-important question. Peppers or Scotland?